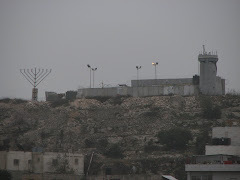 Hebron: (Arabic: الخليل al-Ḫalīl or al-Khalīl; Hebrew: Hevron: חֶבְרוֹן ) is the largest city in the West Bank, located 30 km south of Jerusalem. 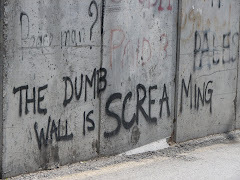 It is home to some 167,000 Palestinians (2006) and app. 600 Israelis. 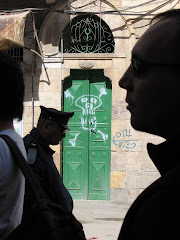 Hebron’s Arabic name is Khalil al-Rahman, which means “the friend of God”. Its short and common version is al-Khalil, “the friend”. It refers to the ancient patriarch Abraham who was friend of God. This is the place where Abraham bought a gravesite for his wife Sarah – the first piece of land he bought in the Promised Land. Abraham and Sarah were both buried here, later also Isach and Rebeccah, and Jacob and Leah. Since Jews and Muslims alike share a great reverence for Abraham as a forefather – it makes sense that this city is important to both religions. Located in the occupied Palestinian territories and the biblical region of Judea, it is the second holiest city in Judaism, after Jerusalem (The four holy cities is the collective term in Jewish tradition applied to the cities of: Jerusalem, Hebron, Tiberias, and Safed). The biblical name of Hebron is “Kiryat Arba”, or “The village of the four”. There are different explanations as to what four the name refers to: The more secular explanation is the four hills of Hebron on which four Canaanite tribes settled to establish the first city-state 5500 years ago. This means Hebron is one of the oldest cities in the world. According to Islamic tradition, Adam and Eve were the first ones to settle down here after having been expelled from Eden. The number could also refer to the four biblical couples who according to myth and tradition settled in Hebron: as already mentioned, Adam and Eve, Abraham and Sarah, Isaac and Rebecca as well as Jacob and Lea. Kiryat Arba, because is today the name of a Jewish settlement of 7-7500 people on the north-eastern outskirts of Hebron. The modern Kiryat Arba plays an important part in Hebron’s conflict scene. Hebron itself is now a city of 170 000 Palestinian inhabitants. There are also four Jewish settlements in the city centre, with approximately 500 settlers. • During the Persian era, Hebron became one of the main cities in the province of the Northern Negev. In Roman times, the prestigious ‘Haram al-Ibrahimi monument was erected by Herod. Ibrahimi is the Arabic name for Abraham. 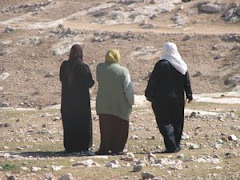 • In the 7th century, Hebron became an important centre for Muslim pilgrims, because of Abraham. A surah in the Quran emphasises the importance of Ibrahim: “I will make thee an example for mankind to follow”. The city is located along the pilgrimage route to Mecca, on the way that connects Damascus to Cairo, 36 km south of Jerusalem, 35 km south of Bethlehem. • In medieval times Hebron fell to the Crusaders. Then it was ruled by the Muslim empire, the Ottomans and the British Mandate. • At the end of the 18th century, Hebron became one of the most important commercial centres in Palestine. Caravans from Egypt came up the in-land route through Sinai and Be’er Sheva. • During the British Mandate, the first half of the 19th century, the population of Hebron increased a lot. Until now two communities of Jews and Muslims had lived peacefully together. At this time the Zionist movement brought new immigrants from the US, from Europe and Russia, who did not have much wish to assimilate to the existing joint culture of two religions, and this wave of immigration disrupted the peaceful co-existence of the two communities. There were national Arabic revolts all over Palestine against the Zionist moves to create the Jewish state. In 1929, rioters killed 67 members of the Jewish community in Hebron, and the British Empire evacuated the rest. If you try to discuss Israel settlement politics nowadays, and criticise the segregation treatment of Palestinians in modern Hebron, settlers might refer to the 1929 events as evidence that Muslims want to kill them and therefore these security measures are needed. • Yehuda Shaul from Breaking the Silence, an organisation of ex-soldiers of the IDF - adds some interesting nuances to this story though: on his tours he says that before this slaughter happened, the Jews in Hebron had been approached by the Haganah (underground Jewish military organisation – the unofficial army of the Jewish Agency) offering them guns to fight the Muslims. 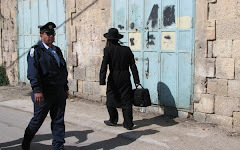 The Hebron Jews had refused to accept the guns, whole heartedly believing that “our neighbours will not harm us”. They were tragically mistaken about at least a few of their Muslims neighbours – although many of the surviving Jews were also brought into safety by other Muslim neighbours who came to their rescue. In any case, this became a story of shame for Jews in Palestine and later Israel – how the Hebron Jews had failed to stand up for themselves and were slaughtered without resistance. This particular part of history became a taboo, and also the Middle Eastern Jews (the Mizrahim) were considered second rate citizens by many of the Zionist immigrants – so for many, many years, history books did not mention the Hebron Jews and their shameful fate at all. 1929 was not common knowledge among the average Israelis until decades later, when as part of the planting and expansions of Jewish settlements in Hebron, the massacre was taken out of the dust and given a very important place in Jewish history. 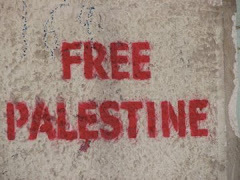 • After the war of 1948, refugees came to Hebron from the southern areas of Palestine and settled in two UNWRA (United Nations Relief and Works Agency for Palestine Refugees in the Near East) refugee camps (3% of the inhabitants of Hebron).